As I mentioned in my Battlestar Galactica season two review, the Battlestar Pegasus arc is one of my favorites in the entire series, so I was really happy when I heard that they were going to make a movie about the Pegasus and her crew. Pegasus’s story is told through a series of flashbacks from the point of view of Kendra Shaw (Stephanie Jacobsen), one of Pegasus’s officers under Admiral Cain, and interspersed with scenes after Lee Adama names Shaw his XO when he takes command of Pegasus. Jacobsen does a fantastic job with her role, and there’s lots of great material with Cain and Gina in the flashbacks, and lots of good stuff with Starbuck (among others) in the later scenes, so I enjoyed the movie a lot and definitely recommend it for fans of the show. Despite the fact that you already know the outlines of Pegasus’s story (assuming you’ve watched season two, of course), the acting is so compelling that it draws you in and makes the actions undertaken by Cain and her crew in the aftermath of the attack on the 12 Colonies shocking even though you already know they’re going to happen. 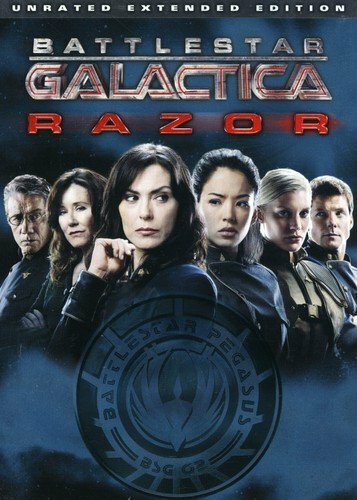 Razor also includes flashbacks from Adama’s backstory as a young pilot in the First Cylon War, when he stumbled on some gruesome early experiments with making humanoid cylons. When should you watch Razor? The movie was released in between seasons three and four, but takes place chronologically in season two, after “The Captain’s Hand.” There are no spoilers for season three in the movie, so personally I’d recommend watching it between seasons two and three, closer to where it fits chronologically. The only caveat is that some fans feel that a few lines of dialogue at the very end of the film suit the tone of season four better than that of season three, and may affect your impression of season three if you watch it first. If you’re concerned about this, fan Thunderpeel2001 has advice for how to skip those few lines.